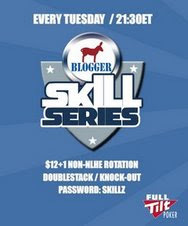 2nd at Ramblers, and the RETURN of the SKILLS GAME! After reading Miami Don's blog and talking by email to him, I am going to give it a shot at bringing back the Skills Game. I always enjoyed it, and it gave me the opportunity to practice more on non-NLHE games. One minor change I am making (at least of the first tournament) is it will not be a double stack. I plan on having it doublestack for Pot-Limit tournaments, but not the Limit ones. Please feel free to leave me feedback on that idea, I will take everyone's thoughts into consideration. So go sign up already!! I also managed to finish 2nd at NYRamblers HA tournament last night. I nice turnout of 17 players, and I entered the final table with a top 3 stack, but was on the left of Loretta8, who was apparently in God Mode last night during the tournament. Say what you will, usually I like being on the left of people with open ranges of hands they will play, but against someone in God Mode, hell no!! Somehow I actually took the chip lead away from him briefly, but a couple of hands where I was likely outplayed, and a few others where I saw that I got rivered out of a pot, and I finsh 2nd. Great game Loretta8 (and to Lightning36 for finshing 3rd). So if Loretta8 was God last night, does that make me Chris Furgenson? Gotta say, I LOVE teh Tuckfard Open. Played HORSE last night, and it was a ball. Very welcoming group of people. Had people (BamBam in particular) welcome be the minute I said Hi, and everyone wished me well when I went out in 5th (I was having fun, what can I say) and invited me back to play again. This is just fun little game for $3.30. I will definately play again. I got hit by the first timers curse at the Hoy last night. No, it wasnt my first time, but first timers usually do great at that tournament. Sure enough, we start with 13, and the first timer was a aggro-donkey and ammassed quite a chip stack, but spewed a good bit of it off, including doubling me up when I was short. I finally got him all-in preflop with AK, knowing that was above his range. Sure enough he had AQ. Jack on the flop, King on the turn, and I KNEW that the 10 would come on the river, and it did. Out 7th. I check back 15 minutes later and they are down to 2, with the first time taking on TwoBlackAces. I really hope 2BA won. Bubbled NYRamblers 6-Max No Limit tournament. Bubbled Skins Game (which I couldnt play 7 Stud Hi/Lo worth a crap). Luckbox my way into through 100 chip Super Turbo Sat for the 7 Stud Hi/Lo MSOP event. Go out really early in said event, as again I couldnt play Stud worth a damn last night. Last night was Razz, and I actually managed to finish 2nd (only 4 people showed up last night!). If you want some more work on different type of games, and a good time to boot, you need to be playing this! Played three tournaments on Tuesday night. The final in the Bodonkey points race, which I was totally out of, but the bounty on Smokkee and the usual prizes were just too good to pass up. Lasted a good two hours there, and was the first to take a shot at the Smokkee bounty, but running A9suited into AKoff was a losing proposition for me, and I eventually went out around 15th place. The Skills game was HORSE, which I played pretty will for a couple of hours also. Was hitting everything the first two hours, and was the chip leader with 15 left, and but a good 3,000 chips too! However my final pass through Omaha H/L would be my undoing, as I got crushed about 4 times in 6 hands and eventually just feebly got pushed out in 10th place. Funny that O8 was my downfall there, as that was teh MSOP Event #6 last night. It started at 8:20 PM EST, and I actually got logged in 15 minutes late, losing only 55 chips in that time. My very first hand I ended up scooping the pot with a Full House. Happy to say I never looked back after that. Played smart good poker, and was constantly in the top 10% most of the tournament. As is unusual for me, I wasnt short stacked when the money bubble broke! When we got down to 5 tables, I end up with a total maniac who is literally playing EVERY hand. Waited for my shots and got some chips from him. I evently got the perfect hand against two all-ins and the maniac, where I scooped the main pot and both side pots, giving me the chip lead with 34 left. I was still in 2nd when we got to 25, but the maniac finally started hitting his draws against me and everyone else. By the time the table broke, I was hurting badly, and ended up going out in 16th. I was really happy with how I played, even though I would have loved to final tabled.